My Orange Brompton: Best cycle friendly cafe ever...shuush! Best cycle friendly cafe ever...shuush! 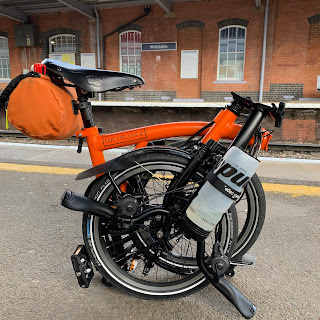 Being a lovely sunny morning and having an errand to attend to near an old haunt, I took my trusty P Type Orange Brompton for a little multi-modal travel. With my errand completed and feeling I needed the reward of a cup of tea I was about to look for one of the high street brand names where one can buy such an item. In doing so, I stumbled across perhaps the best cycle friendly cafe, bar none! The cafe in question was an independent family owned and staffed affair and although not one of the trendy cycle-specific types, was more than happy for me to bring my Brompton in. Inside I was greeted by friendly staff and a section of cakes I was informed, all home made. I ordered a slice of pavlova, the size and quality of which was impressive. This was washed down with several cups of tea from a pot that sat happily on my small table. The cafe was quite busy despite it being 10:03 on a Tuesday morning. I should tell you where it is. I should tell you its name. I should do all these things...but I won't. For the moment at least I am like Howard Carter upon discovering the steps leading down to the tomb of Tutankhamun's, covering them up again so that his benefactor Lord Carnarvon could see them a few weeks later. In a few weeks I will almost certainly reveal to the world - or London - the name and location of this oasis but for the meantime I will just have to keep it to myself. The dream team ride once more!